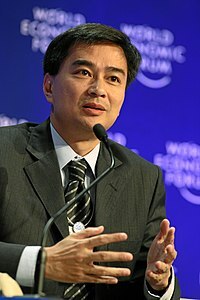 Any communicator who have had the chance to see both Indonesia’s Susilo Bambang Yudhono and Thailand’s Abhisit Vejjajiva speak in public would probably have put their money on Abhisit winning any Communicator of the Year Award. Apart from his good looks, the Thai Premier is suave and articulate with a English public school accent. In contrast, SBY comes across as stilted, confusing and sometimes downright clumsy.Some of his harsher critics have been known to use the word bovine. Yet the Public Affairs professionals seem to have thought differently and they voted SBY over Abhisit. “Through his election victories, and his work both domestically and internationallyC, SBY has shown himself to be a formidable communicator and a highly effective modern politician,” Mark O’Brien, the vice president of Public Affairs Asia said about SBY’s victory. That statement is so general that it could mean anything. Unspun is absolutely curious whether Public Affairs Asia would care to elaborate on what they mean by “his work both domestically and internationally.” While the mystery still stands, however, one thing is certain: Hans Vriens, the former head of APCO in Jakarta (which is still functioning in spite of more-or less closing down) and who now heads his own consultancy is certainly not in a bad position to be for a public affairs consultant to be where Indonesia is concerned. Indonesian president Susilo Bambang Yudhoyono (SBY) has topped the list in the The Gold Standard Award in Political Communications. The president saw off eight other nominees to secure award, which forms part of the PublicAffairsAsia Gold Standard Awards programme. The president’s son, Edhie Yudhoyono, collected the award at a gala reception for senior PA professionals organised by PublicAffairsAsia at the Foreign Correspondent’s Club in Hong Kong on February 4. Yudhoyono was nominated by Hans Vriens, the founding managing director of Vriens & Partners, the Singapore based PA firm which is linked with Jakarta-based Kiroyan Partners. Yudhoyono saw off Thai prime minister Abhisit Vejjajiva, who was nominated by Sebastian Beaumont, the managing director of the Marque Consulting Group, a specialist public affairs and consulting firm in Thailand. The third finalist was Ryan Gawn, a British charity campaigner who mounted a highly effective programme to mobilise British government support for Save the Children’s work in Afghanistan. Yudhoyono topped the contest after securing a historic second term victory in last year’s presidential election. Commenting on the award, PublicAffairsAsia’s vice president, Mark O’Brien, said: “This award allows professional political communicators and lobbying professionals to identify achievement by the politicians and campaigners with whom they work. Hans Vriens is a clown who could not past 10 with his pants on. Would make a brilliant addition to the European Parliament or European Commission. SBY can talk, alright. That’s the problem, only talks and complains, but not much action. Establishing Ketuanan Melayu with an Indonesian heritage?